Kevin Sheedy is an AFL living legend. Having coached Essendon Football Club to 4 Premierships, Kevin then became the inaugural coach of Greater Western Sydney. An amazing coach and passionate speaker, Kevin is a highlight for any event or conference. Kevin Sheedy has been a success as a player and coach and is without peer when it comes to being innovative and engaging new communities in the game. As an ambassador to the AFL, he was heavily involved in developing the Greater Western Sydney side. He was a driving force in the development of AFL Sportsready, a program which has provided more than 4000 jobs for young people. In addition, he was a major innovator of new AFL events including the Anzac Day match between Essendon and Collingwood, the Dreamtime at the ‘G match to celebrate indigenous players and Essendon’s strong presence in the Sydney market. Kevin is known as much for his off-field work as he is for his premierships. In 1998, he broke the record for coaching more professional AFL games than anyone else in history. With a total of 886 games under his belt, he holds the AFL record for the most games combined as a player and coach. Kevin Sheedy’s AFL career began with the Prahran Football Club in 1964 and was followed by 12 years with Richmond, where he played 251 games and was a member of the Premiership teams in 1969, 1973 and 1974. In 1973 Kevin Sheedy was appointed assistant skills coach and club development officer. While in this role he conducted football clinics at schools, junior and country football clubs, and shopping centres. He also introduced a Melbourne suburban football competition for children. During 25 years as coach with Essendon, Sheedy coached 330 winning games, 167 losses and 5 drawn games, giving him a 66.09% win ratio. In addition, he competed in seven Grand Finals, playing premiers in 1984, 1985, 1993 & 2000, won six of the eight ‘Night’ Grand Finals, and was recognised as the ‘All Australian’ coach in 1985, 1993 & 2000. The club’s membership increased from 15,000 to 36,000+ and much of the club’s success off the field is attributed to Sheedy’s unique marketing skills and personal popularity with supporters. 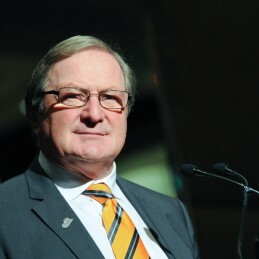 Indeed, Kevin Sheedy has been a catalyst for many changes in AFL: respect for interstate football during the 1980’s, an expanded interchange bench at the state and club level, a new level of versatility among players, the growing influence and confidence of Aboriginal players, clever manipulation of the draft and apprenticeships in football. “Sheeds” incredible run as Essendon coach came to a close at the end of the 2007 AFL Premiership season. He continued on in an ambassadorial position with the AFL and took up the position as coach of the new Greater Western Sydney team in late 2009. Kevin has long been an ambassador for the game throughout Australia. He has done a great deal of work with Aboriginal communities in the northern parts of Australia, encouraging young Aboriginal people to take up the game, and being a vocal supporter of anti-racial vilification laws in the game. He also encouraged foreign players to train with his side including a former American footballer, a skillfully athletic Ethiopian immigrant and more recently two gallant Japanese try-outs. Kevin Sheedy has racked up numerous appearances on television and radio, including appearing on FOX FM’s Friday morning football tipping with Tracy Bartram and Matt Tilley in 2003 and 2004. He writes columns for the Herald Sun and is a spokesman for Aquamax Australian water heating systems. Kevin Sheedy has co-authored several books, and in 2008 released his life story, Stand Your Ground. He is a life member of the Richmond Football Club, the Essendon Football Club and the Australian Football League. He received the Advance Australia Award in 1993, was honoured in 1998 as a Member of the Order of Australia in recognition of his service to sport and the community, awarded the Australia Sports Commission Coach of the Year for 2000 and was also awarded an Australian Sports Medal in recognition of his service to Australian Football. Kevin is a member of the Team of the Century of the Richmond Football Club, and in 2003 he was awarded the Australian Centenary Medal.